Our camper was constantly full of damp to wet washing. Although all the sites we stayed on were theoretically open all year, not one had a tumble drier. On our campsite, we have two washing machines (4€50 per wash) and two driers (3€00 per token). We also have four 'whirlygigs' dotted about on the campsite for campers to use. We did find it a bit of a drag to uproot each time we wanted to go anywhere. On our campsite, we have :fresh bread and croissants available to order every morning plus the basics – fresh milk, butter etc throughout the season. Our shop – open in mid and high season – stock all the basic essentials but not fruit, veg or fresh meat. There are a number of restaurants within walking distance from the site (not to mention our own site 'brasserie' which is open all day in high season and 6 days a week in mid season (closed Wednesdays). You can hire bikes from Reception and you can even hire a car from a local supermarket! - please ask us for further details. Intermarché is the nearest supermarket (7km) – there are no height barriers and spacious parking at the back of the car park is available. Most of the châteaux have big car parks specifically for motorhomes. You can park for 1€ per day at Clos Lucé in Amboise (Leonardo Da Vinci's last home – now & museum and park devoted to his life and works and well worth a visit). 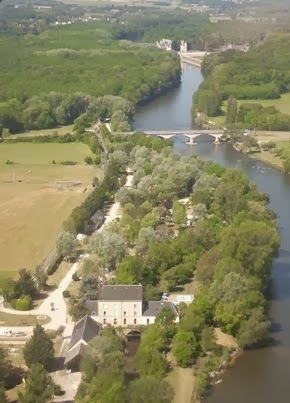 From here, you can also walk into Amboise, visit the excellent Sunday morning market, have a coffee in the town square, see the impressive château overlooking the river Loire, and come home again. Having done it ourselves, we can see why it's tempting to change campsites each night, calling in at a different tourist attraction each day, if you're on a sightseeing tour. But if you want a slightly more relaxing holiday, consider staying at one place for several nights and going on some circuit routes-we can advise you at Reception. It's nice to 'land', know where you're at for a couple of days. Our pitches are generally flat, easy to position your camper on, and access is good. One final tip – consider getting a reserved pitch sign made, maybe with your number plate on. Specific to you, and not worth nicking (unlike your favourite comfy camping chairs...), it will ensure your chosen pitch is still available for you when you get back from a day out! If you have any other useful tips or comments to put on this page, please send us an email.